I get redirected onto what looks like UK results. Seems to be a Chrome-specific bug, and it behaves as expected in FF. Interesting all the same, and hopefully Bing will fix this. 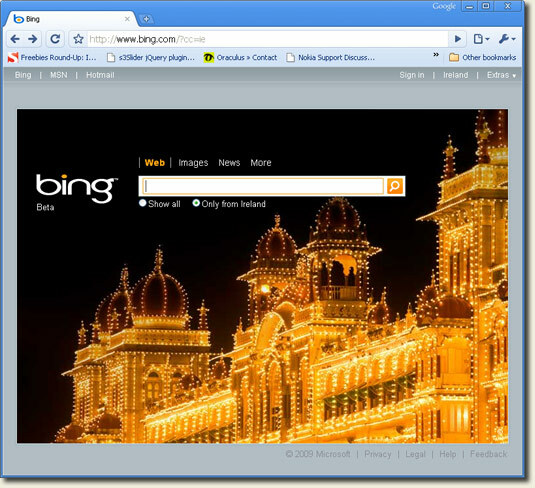 Hadn’t noticed before, but while on bing.com homepage try resizing the window. Really neat the way they resize the main image area. I tried searching for my site as per the above instructions and the results are as expected when clicking on ‘Show all’ or ‘Only from Ireland’. 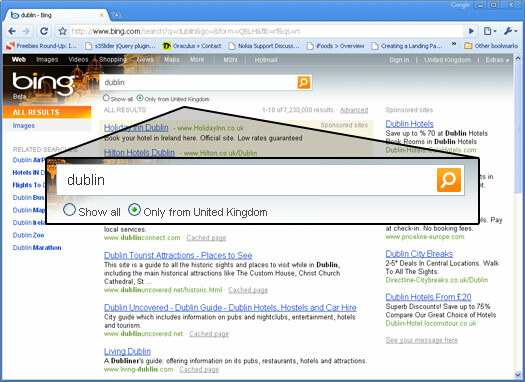 The Only from Ireland option give Irish listings. Still the same for me using Google Chrome. Maybe a cookie issue (I seem to be finding a lot of these right now). Are you trying in Chrome? Hmm, works fine for me in Chrome. Might be a screwed up IP address lookup or something? One thing I love about Bing are the backgrounds though – they have some gorgeous photos. It looks like they have this fixed as it works for me just fine now. When I try this I don’t seem to be having any issues with it. It looks like the problem has been corrected.